Wondering what’s showing on TV today, tomorrow, or next week? 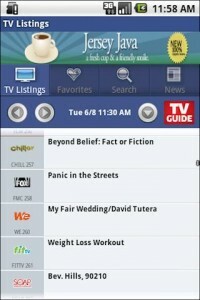 The easiest way to find out is by using the TV Guide Mobile Android app! This is by far one of the most used Apps on my smartphone. I use it on a daily basis to quickly find out what’s showing on TV. You just install the app, enter your zipcode, and select your cable provider. The app does the rest! It will list all the TV shows by channel & show times. If you click on the title of a show, it’ll also give you details about the show. You can even setup reminders so that an alarm goes off when your favorite show is on. How awesome is that?! As you can see, I love this app. Highly recommend it for all you TV addicts. 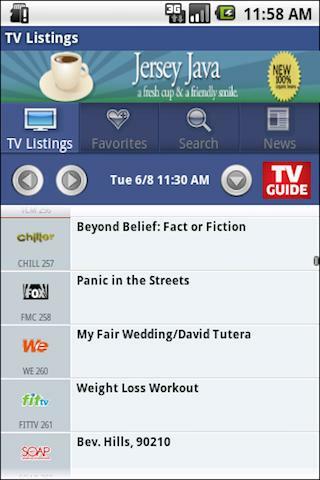 Just go to your “Market” icon on your phone and click the search button and type in “TV Guide Mobile”. Install the app and start browsing for TV shows! 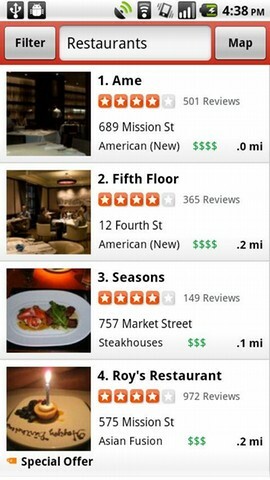 Yelp is a great app for helping you find local places to eat, shop, drink, and play. You can also read and/or submit reviews on all the places listed. I find it to be a very useful app when I’m visiting other cities and looking for a place to eat or drink. I just pull out my Droid and launch Yelp to start browsing for places that are well reviewed. Give it a try and let me know what you think. 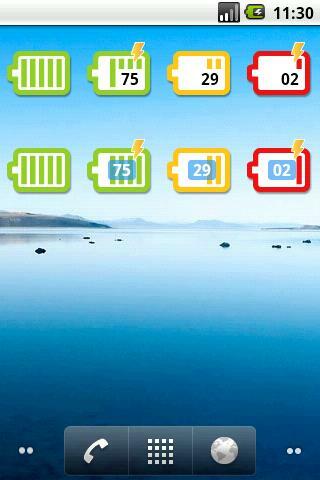 Quick Battery is a must have app for those of you who are concerned with monitoring the battery life on your Android smartphone. The stock battery indicator on your phone isn’t the best indicator of how much battery life is actually remaining on your device. Quick Battery, on the other hand, will provide you with a Widget that will give you the exact Battery Percentage that remains on your device. 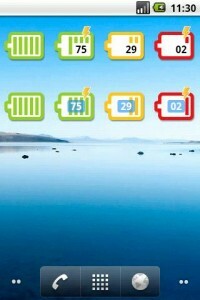 It’s very useful for when you want to monitor the battery life. Quick Battery can also show you some useful stats on what has been sucking all the battery life out of your phone. For more info on using Quick Battery and getting the most out of your Battery, be sure to check out my video tutorial on How to Monitor Battery Usage on your Android smartphone. 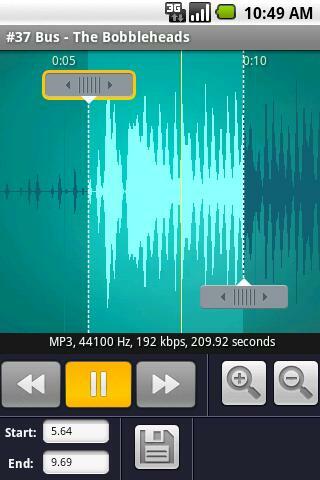 RingDroid is one of the coolest Apps I have found on the Android Market. 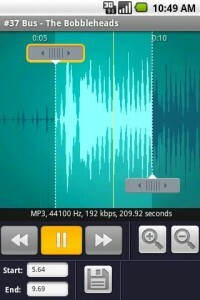 It allows you to create custom Ringtones, alarms, or notification sounds by using MP3’s on your phone. I never would have imagined making custom ringtones could be so easy. 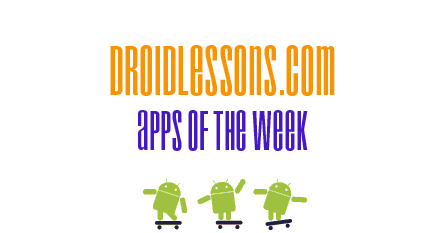 You just launch the Ringdroid App, select an MP3 song that’s already loaded on your phone, and then find your favorite part of that song and click Save. Then go to your settings and set it as your ringtone. You now have a custom ringtone! 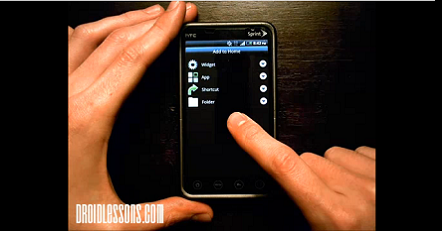 If you have any trouble figuring out how to use it, just let me know and I can make a quick video tutorial. Like the Quick Battery app, power management app like this would be very useful as most of the Android phones don’t have the best the battery life. Thanks for sharing the apps.